Three young, black men under the age of 25. They fit the basic profile of those most likely to be victims of knife crime. Speaking in simple statistical terms, they are also most likely to be prosecuted for knife crime. Aged 17 to 19, these young men are hard-working college students who also love basketball. All studying at Newham Sixth Form College, where students have organised a knife-crime awareness day, they have each been affected by knife crime or the threat of it in some way. Clyde, 19, had a friend who was killed in a stabbing outside the McDonald’s where he works nights. “He was eating and chatting to me. He said goodbye and left, and then there was this fight outside. We were told to stay inside. Clyde says: “Now I feel like I am living on the edge. “Just before this, one of my friends got mugged for his phone. No-one did anything. No-one came to help,” he adds incredulously. His friend Tyrone, 18, says in a rather matter-of-fact way that a couple of his friends have been stabbed. He feels it has become so common that it is now treated like burglary. Where he lives in north Woolwich, “it’s not too bad,” he says. So he tends to stay away, he says. But his friend Menelik, 17, says: “I can’t stay out of it because I live there. His parents encourage him to be careful making friends. 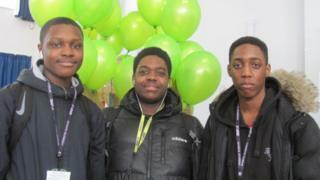 All three students say they have been stopped and searched numerous times by the police. Tyrone says he has been searched 16 times in four different areas. The experience seems to have frightened him at first. “Then I thought, I have nothing on me, and I figured out what to do. “They thought I was carrying drugs,” he says. They all express irritation at the experience, especially since it made them late for college and work, but they seem resigned to it. Menelik says he feels he was searched on the basis of what he looked like: “Most boys of our age wear the same thing – a tracksuit and a jacket. “More time it’s because we are doing sport,” he says. “More time it’s just that it’s comfortable,” says Tyrone. Clyde says the stereotypical representation in the media of young black men as perpetrators of crime upsets him. He’s not the only one dissatisfied with society’s response to burgeoning rates of knife crime. Philleen, 17, says the police need to “step up” and deal with the issue. There are Metropolitan Police officers from the partnership and protection team taking part in the event, informing the students and engaging them in debates. But on the streets, Philleen feels the police can be a bit too aggressive and would like to see “safe havens” in the community. “There should be more places to run to,” she says. And it sounds like the trust issue permeates into relationships with people of their own age too. “We are afraid to make new friends and meet new people,” she says. The young women at the event seem palpably shocked by the recent stabbing to death of Jodie Chesney in east London. Sharnaly, 18, says when she heard the news of the killing she thought it could have been her. “To be honest, I don’t feel safe in the streets when there are no people. Nicoletta, 17, is also fearful but, like the other students at the event, she feels awareness is the answer. “People carry a knife because they feel they would be safer. If someone comes down and they’re in danger and then they pull the knife. College Principal Mandeep Gill is proud of the students’ campaign.